All change for A3 | What Car? 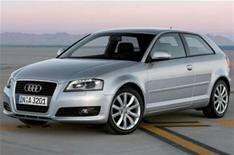 Audi has revamped its A3 range, with prices starting at 14,995. All four petrol engines have been revised to lower emissions, with savings of up to 15% depending on the trim and gearbox type. The diesel range has also been extended to include 137bhp and 167bhp 2.0-litre units. The lower-powered unit is expected to be the best seller, and emits up to 15% less carbon dioxide than the older 2.0-litre engine it replaces. Standard specification now includes manual air-conditioning at no extra cost. SE has been adjusted to include a multi-function leather steering wheel, a front centre armrest, front foglamps and 16-inch alloy wheels. It costs 650 more than the standard model, but it costs 1350 less than the previous SE version. All front-wheel-drive models can be upgraded from the standard six-speed manual gearbox to Audi's S tronic semi-automatic gearbox. In addition, higher-specification models can be upgraded to include Audi's magnetic ride system, which adapts the car's ride and handling according to the driver's preference. This was previously only an option on TT and R8 models. The revised range will be available from July.